We come together as God’s people, welcoming each person at different places in their walk of faith, creating a stimulating environment to explore and grow in one’s faith. Worship is casual traditional, filled with joy and music. Ministries for children, youth and adults explore a broad range of faith expression, honor questions and respect individuality. Ministries of compassion and social change work locally and globally to embody love, respect and Christian hope for all. Activities include all generations for mutual support in time of need, social fellowship, education, music and mission. We are people who know the power of forgiveness, joy and love. As a congregation of the Presbyterian Church (USA), Pinnacle Presbyterian Church strives to enjoy, proclaim, and embody the love of God revealed in Jesus Christ. We respond for the spiritual, physical, emotional and intellectual needs of all persons in the congregation, in the community, and in the world. Yet we are more than our beliefs. We are also an expression of our mission in the world, which the same organizing statements of Presbyterian life describe in this way: "The great ends of the church are the proclamation of the gospel for the salvation of humankind; the shelter, nurture, and spiritual fellowship of the children of God; the maintenance of divine worship; the preservation of the truth; the promotion of social righteousness; and the exhibition of the Kingdom of Heaven to the world." (The Book of Order) That language comes from a hundred years ago, but the mission remains the same for us today: to share the good news of God's love for all, to care for people inside and outside the church, to worship with enthusiasm and awe, to learn together and to work for justice and hope in a needy world. We hope you'll join us in this mission. For more about the Presbyterian Church (USA), read the Book of Order or go to http://www.pcusa.org. As Presbyterians, we do not stand alone as a congregation. We share ministry, mission, and responsibility for church life with nearly 80 Presbyterian congregations in the Presbytery of the Grand Canyon, which covers roughly half the state of Arizona. 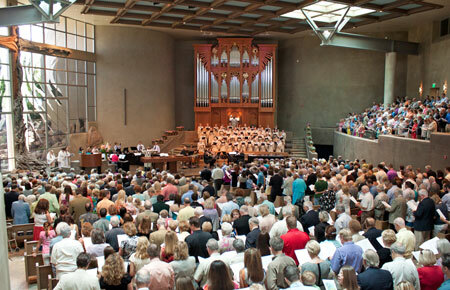 Nationally, we are one of the largest one hundred and fifty among over 10,000 congregations in the Presbyterian Church (U.S.A.) which is itself the largest among six denominations (associations) that share the name Presbyterian. In the heart of the Sonoran Desert, Pinnacle Presbyterian Church invites all people to hear God’s story and experience God’s love expressed in the life of Jesus Christ; and by the power of the Holy Spirit, we strive to equip the generations with the practices of our faith. At the foot of the mountain we created a sanctuary. We come together as God’s people, reaching out to make a difference in one another's lives, in our community, and around the world. We express our faithfulness through excellence in worship, the arts, serving meals, building homes, crossing borders, and nurturing children and youth. We are people who know the power of forgiveness, joy and love.